Hailing from Queens, New York, Dougie Almeida spent most of his adult life as a corporate presenter for one of the largest financial planning firms in the country. His specialty was taking lifeless insurance presentations and transforming them into works of comic art. In his spare time, he fought as an ISKA Heavyweight Muay Thai Kick boxer, retiring at 10-0 and earning the title “Always Dangerous”. So, what do you get when you cross an inventive corporate executive with a retired kick boxer? view more.. Winner of Improv’s New Faces of Comedy & participant in Laughing Skull Comedy Festival, Gilda’s Laugh Fest, SLO Comedy Festival & Boston Comedy Festival & Semi Finalist in Cleveland Comedy Festival 2013, Laughlin Laughfest 2014 & World Series of Comedy Main Event 2015. Prior to taking the stage, Dougie gauges his audience, reaches into his vault and prepares his onslaught of humor. Once on stage, he delivers blow after blow of hilarity, hitting the audience with punch line after punch line. His wit and stage presence is second to none. 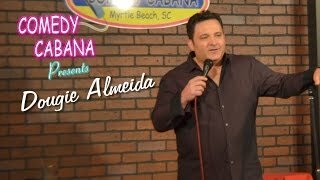 One thing is always certain – Dougie Almeida will KNOCK YOU OUT! Dougie Almeida is Always Funny, Always Professional, and yes, Always Dangerous.